Kittens that sneeze a lot need a trip to the vet. Cats of all ages are prone to upper respiratory troubles. If your kitty starts sneezing and has a runny nose, you can figure she’s probably got one of the more common cat bugs. These are usually quite treatable, especially when you catch them early, and they’re sometimes preventable. When your pet comes down with a kitty-cold, she may have contracted bordatella, chlamydia, feline herpesvirus or calicivirus. Any of these can cause not only sneezing and a runny nose, but also chest congestion, fever and coughing. Bordatella and chlamydia are both bacterial infections, while herpesvirus and calicivirus are viral, with the latter two causing the majority of upper respiratory infections in cats. All of these can affect cats of any age, but they are typically more dangerous for cats who are either very young or very old. Upper respiratory diseases commonly pass from a sick cat to a healthy one in much the same way that you might catch a cold or the flu. 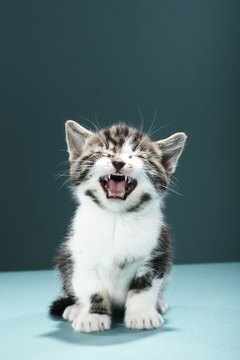 A kitten that gets sneezed on or who comes in close contact with a sick cat will be exposed and is likely to get infected. She can also get the germs from a shared litter box, food and water dishes. The risk of your kitten getting sick increases if she’s in a crowded situation such as a shelter or cattery, or if you board her where there are lots of other cats around. Your vet can vaccinate your kitten to prevent a number of these cat diseases. Most vets recommend either the FVRCP or the RCCP shot for kittens. The FVRCP shot will protect your kitty against feline viral rhinotracheitis -- another name for feline herpesvirus -- calicivirus and panleukopenia – also known as distemper. The RCCP vaccine covers rhinotracheitis – yet another name for the cat herpesvirus -- chlamydia, calicivirus and panleukopenia. The bordatella vaccine is separate. Which shot your kitty gets depends on your vet’s preferences and your kitten’s level of risk. Your pet’s lifestyle factors into the decision. Kittens that sneeze and have a runny nose but otherwise don’t seem sick might simply have an allergy. Just as with humans, a kitty’s immune system can get overly sensitive and react strongly to pollen, perfume, dust and other tiny particles. If you suspect your pet has allergies, take her to the vet to rule out serious illnesses. You can help a cat with environmental allergies by keeping her bedding clean, using dust-free kitty litter and protecting her from strong scents. Your vet may suggest other actions as well. Chatsworth Veterinary Center Virtual Library: What does FVRCP Stand For? Can Cleaning Cat Litter Boxes Cause Sinus Problems? Why Do Cats Meow in the Morning?